Dealing with ADHD can fall somewhere between a winding road and a hair-raising roller coaster. I feel for families who have had sleep problems like ours and I love to share whats working for us. We’ve found the best weighted blanket for ADHD. My son has had great success using a weighted blanket for ADHD – it calms his anxiety at bed time and induces a more restful nights sleep. For many kids, the diagnosis of ADHD is not just about hyperactivity. If you are like our family, it may be the least of your worries. A whole host of other symptoms can come under the ADHD umbrella – anxiety, sensory issues, sleep trouble, emotional disregulation – to name just a few. In our family, we can list anxiety and trouble sleeping at the top of our list. I know sleep is so important for kids in general, but less sleep can really exacerbate the symptoms of ADHD. Getting the recommended 10 to 12 hours of sleep can be really difficult. Kids with ADHD may have trouble calming themselves down at the end of a busy day. Once asleep, they may wake up frequently and have restless sleep. I have been hyper vigilant about my kids getting at least 10 hours of sleep a night. (I have an entire blog post devoted to our bedtime routine.) Many nights, even with our time-tested bedtime routine and our supplements, dozing off to sleep was still a challenge. 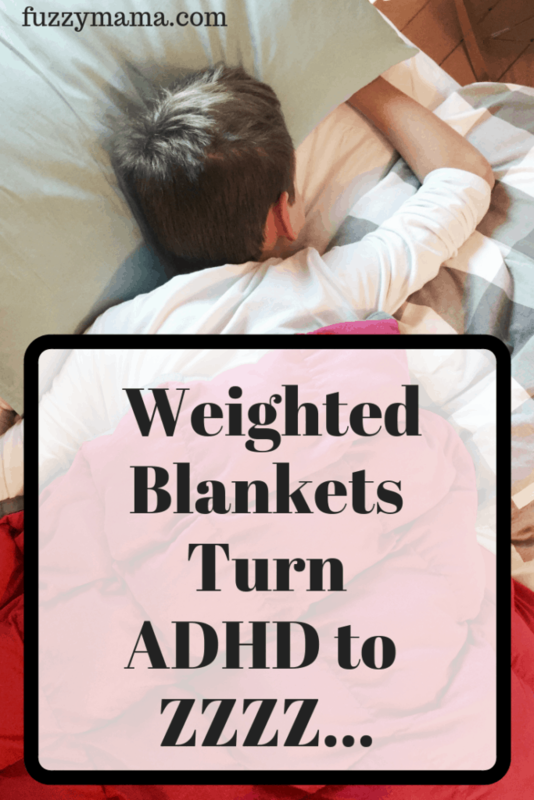 I was familiar with weighted blankets, but thought they were more for kids falling on the autism spectrum – I did not know weighted blankets could help someone with ADHD. I was so wrong. In fact, there have been many, many studies which have proven that using a weighted blanket for ADHD can have a therapeutic effect. 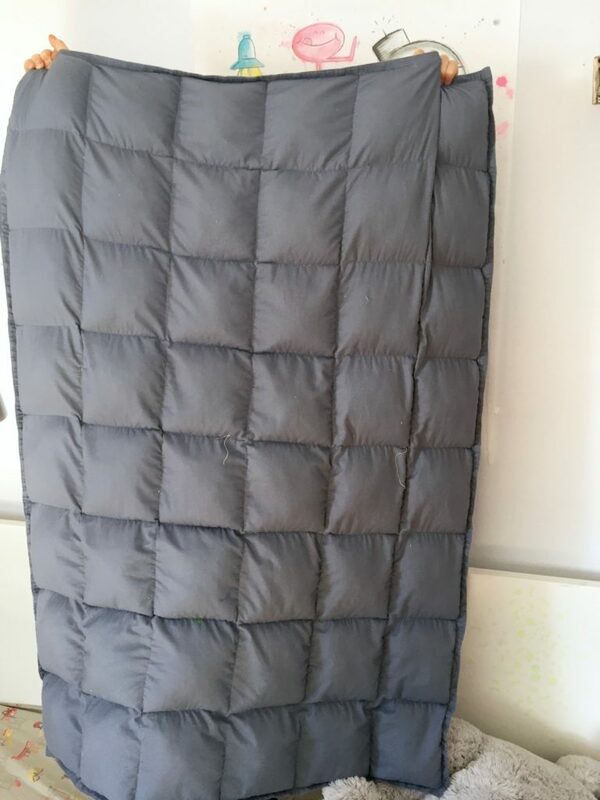 It was not until a friend shared how a weighted blanket had helped her sons with ADHD that I bit the bullet and bought one for us. 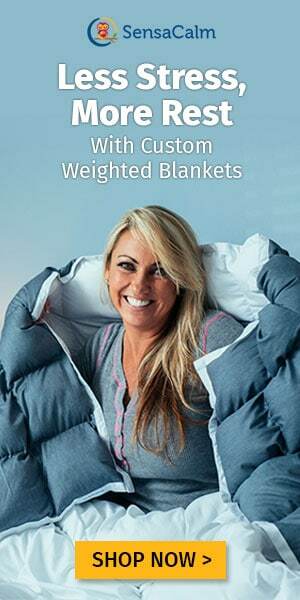 Weighted blankets–where the weight is evenly distributed throughout the entire blanket–can be a great source of Deep Touch Pressure. 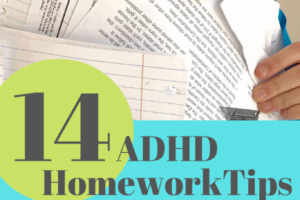 The pressure can reduce the bodies “fight or flight” activity so often seen with ADHD. Not only that, this Deep Touch Pressure can help with sleep. The pressure releases serotonin in the brain which helps regulate mood and provide relaxation. Serotonin also has a big part in the production of melatonin – your bodies natural sleeping aid. 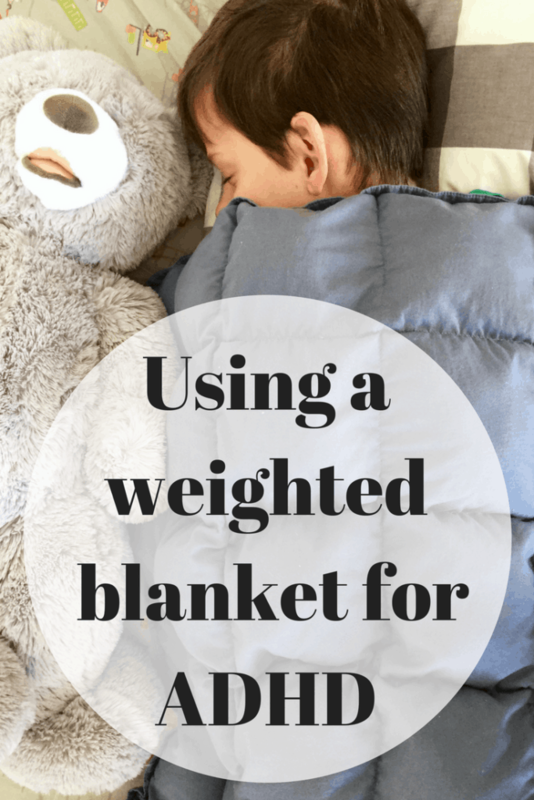 Many kids find weighted blankets to be a great benefit in many other areas , as well. They can help kids focus on school work and provide relaxation when needed. These adorable weighted stuffed animals are great for use in school settings or while reading or doing homework. My son uses his weighted blanket primarily at night to help ease the transition to sleep. Most nights he is asleep in under 10 minutes with this blanket. I can’t tell you what a relief this has been for us. My son gets more sleep and I can relax knowing I get time in the evenings to do a bit of relaxing myself! When my son was a baby, he LOVED to be swaddled really tightly – swaddling releases all those same great brain chemicals as the weighted blanket – so this makes total sense now. The weighted blanket is giving him that sensory input that his body craves at age 11. My son now says, “Mom, I used to hate sleeping, but now I see how relaxing it can be.”! I got my evenings back to do as I please! What a gift this has been. I used to sit on the stairs waiting for my son to stop trips to the bathroom, calling out to me, talking to his brother…90% of this has disappeared. I wish I had gotten a weighted blanket earlier!! While there are many different companies that sell weighted blankets, they are not all created equal. I bought ours from SensaCalm and I could not be happier with it. SensaCalm was started by Donna Chambers, a grandmother who was trying to find help to calm her grandson after he was diagnosed with autism. 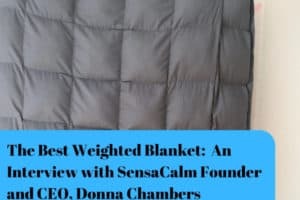 Donna began sewing blankets in her church basement and it is no surprise that she has built the company into the World’s longest running weighted blanket company. The blankets are such high quality…..ours has been used nightly for two years and has not even one loose stitch. Blankets are typically sold according to a childs age and weight-and yes, they make them for adults, too! The SensaCalm sight has a really nice “how to purchase” section. My son was about 70 pounds when we purchased ours and his weighs 8 pounds. Children may prefer a slightly lighter or heavier blanket than suggested, so make sure you can exchange your blanket. The blankets are not huge and are meant to fit just over the body. We use ours over a down comforter in winter and with a lighter blanket in the warmer months. Weighted blankets are costly. I can honestly say, it is one of the best ways I have spent money in a long time. (SensaCalm does have a great clearance section where I purchased ours.) The benefits of a restful nights sleep effect so many other aspects of my son’s – and our family’s life. Read about my favorite breakfasts for ADHD here. 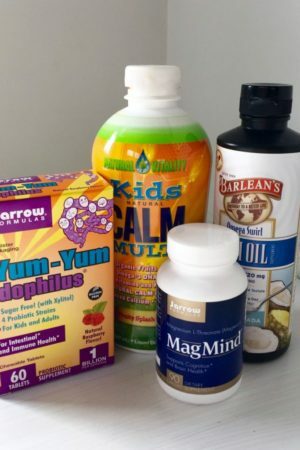 Need more help getting your ADHD child to sleep. Read about our successful sleep routine for ADHD here. 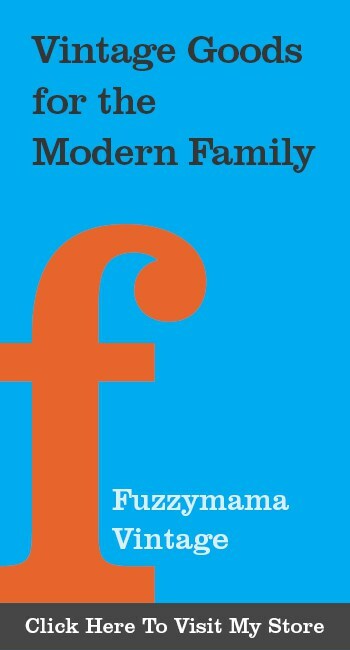 In the market for a good parenting read? I share three of my favorites here. PIN NOW, SAVE FOR LATER !! Disclaimer: Some of the links in this post are affiliate links. If you purchase a product with these links I may get a small commission at no extra cost to you. I only recommend products that I purchase myself and have had share-worthy success with. Would this work well for someone diagnosed with ADD? Hi Nina! The diagnosis of ADD versus ADHD holds such a fine line. Both my sons have an ADHD diagnosis and they could not be more different! I knew my son loved to be swaddled tightly as a baby which was a clue and he also loves tight spaces and goes under covers and under furniture when he is over stimulated. I do not have a diagnosis, but love my son’s weighted blanket on my lap when I read. I think it has benefits for lots of people! Let me know if you give it a try and how it goes.Thanks for your question. My son is 5 and has adhd (combine, hyperactive and impulsive). We are currently on intuniv 1 mg, vayarin, and focalin Er 5mg, with a goal of transitioning off the focalin once the intuniv fully starts working. We’ve tried 4 medications, afternoon irritability is his biggest side effect on stimulants and we don’t need to give an afternoon boost due to his age and the fact that he doesn’t need to focus in the afternoons, we are under pediatric psychiatric care, We are already seeing benefits of the intuniv and kept him off focalin for spring break and he did great. He is an amazing sleeper. Is asleep very quickly no matter how off his bedtime or routine may get, although the majority of nights we are consistent. He also has a history of night terrors, pre diagnosis and medication. They’ve started back up again, do weighted blankets help with night terrors too? . HI Dawn, we are getting off focalin, too–I think it makes my son more angry and explosive in the afternoon and evening. In terms of night terrors, I can’t speak from personal experience because neither of my boys have those. I did a quick bit of research and it looks like weighted blankets do help. You might want to call SensaCalm-they have great customer service-and ask the question. Thanks. I will. I’ll also need one with a waterproof cover since we still sometimes have bedwetting too. This medication thing is so tough. 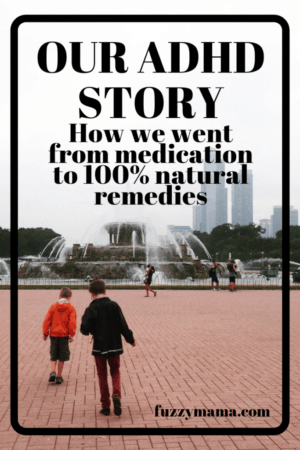 So beneficial for him at school and he has made great progress, but when he comes home there’s about 2 hours of intermittent irritability, sensitivity, lack of effort, etc. and then he’s great come about 5pm. We’ve done the afternoon dose and it helps with the emotional stuff, but then he doesn’t eat as much and has a much harder time falling asleep. I have noticed the vayarin helps with the emotional things too. You’re doing good-it really is one day at a time. FYI, ADHD has recently been put on the autism spectrum. Also, I really liked this tip of using a weighted blanket. I think I will try it for my ADHD kids. Thanks! HI Janet…..good to know, I thought it was on the spectrum when my son was diagnosed 3 years ago and then taken off…makes total sense that it is. The weighted blanket was a game changer for us!! Thanks for reading! Every bit of research that I have done and our dr. states that ADHD is not on the Autism spectrum. I’m curious as to where you obtained this info. Hi Beth….I had to go back to look at my post to see what you referring to. Sorry if my wording was confusing, but I said that I had heard of weighted blankets being used for kids on the Autism Spectrum but NOT for ADHD. 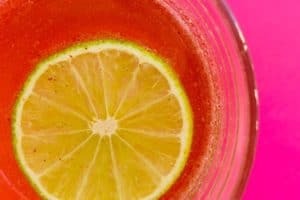 In the four years I have been learning about ADHD, opinion has seemed to shift as to whether it falls on the Spectrum. Yes, all the latest stuff I have read says that ADHD and Autism are two separate diagnosis, but have many, many overlapping symptoms. In my opinion, the diagnosis does not matter as much as the kid, because every kid is soon different as to how they present. An ADHD diagnosis is often the first step for someone who later is diagnosed with a Spectrum Disorder. Thanks for asking a question that made me do a bit of research! Thanks for reading….you have a beautiful website!